I went to Borneo to photograph orangutans in the jungle for the new Ollie the Orangutan book. 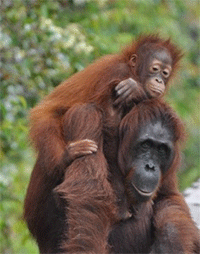 One day a mother orangutan and her tiny baby walked towards me. I had left a cold bottle of water and a warm bottle I didn’t want on the deck. The mother felt the warm bottle and put it down. Next she felt the cold bottle. With her huge hairy hand she delicately peeled off the cellophane wrapping, unscrewed the lid and drank my cold bottle of water. 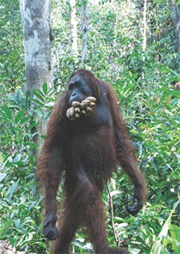 The next day I quietly followed another orangutan. She was beautiful up close with glorious orange hair, and her hands and feet were graceful. Suddenly a male orangutan plopped down right in front of me. He looked at me with big doleful eyes, then sat on a branch to examine me. Satisfied, he started to show off his acrobatic skills and hung upside down with a silly look on his face. I had the privilege of holding these lovely babies at Dr Birute Galdikas orphanage.